Apart from the new Devil’s Canyon processor, Intel has also announced yet another enthusiast-oriented processor at the on-going Game Developers Conference. 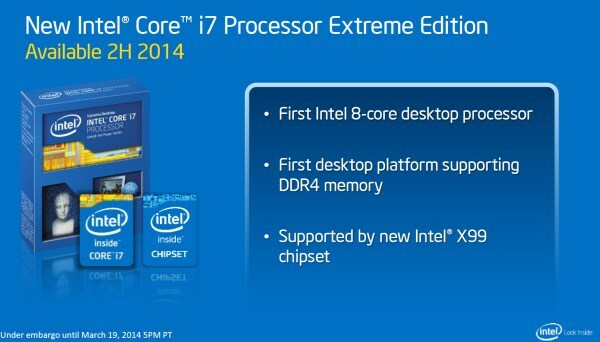 Part of the company’s long running Extreme Edition high-end processors, this upcoming Intel Core i7 Extreme Edition processor is Intel’s first 8-core, 16-thread desktop processor and based on CPU architecture called Haswell-E.
As a comparison, the current top of the range Intel Core i7 Extreme Edition processor – the Core i7-4960X which is based on Ivy Bridge-E architecture – comes with 6 CPU cores and 12 CPU threads. Apart from packing plenty of processing power, it will also be supported by a new chipset named Intel X99 and together, they will become one of the first desktop platform to support the equally new DDR4 memory. While the new 8-core Intel Core i7 Extreme Edition processor will be released sometime in the second half of the year, Intel didn’t provide detailed information regarding it at the time this article is written. We will continue to keep you in the loop once Intel churned out more information for us to convey to all of our readers here.